Post contributed by Dr. Paul Sommerfeld, Rubenstein Graduate Intern for Manuscripts Processing and one of Duke’s newest PhDs in the Dept. of Music. By the age of 26, John Armstrong Chaloner (1862-1935)—or to his friends, Archie—had amassed a fortune of $4 million and seemed poised to live the privileged life the wealthy elite of New York City enjoyed in the late nineteenth century. In 1897, however, his family had him involuntarily committed to a psychiatric hospital. Chaloner spent the next 22 years fighting to prove his sanity. His papers, a mixture of correspondence, legal documents, and writings by Chaloner himself, offer not only a fascinating portrait of Chaloner but also a snapshot of attitudes toward mental health in the early twentieth century. In the 1890s, Chaloner became interested in psychological experiments. He believed that he possessed a new sense, which he termed the “X-Faculty.” Among many claims, Chaloner stated that the faculty provided him a profitable stock market tip, would turn his brown eyes gray, allowed him to carry hot coals in his hands unharmed, and caused him to resemble Napoleon. Chaloner’s family regarded his claims—in addition to his blasé attitude toward the scandal of his divorced wife, the novelist Amélie Rives—as evidence of insanity. Chaloner continued to live near Rives’ estate in Albemarle County, VA, and even befriended her second husband. Chaloner’s brother reportedly labeled him as “looney.” In response, Chaloner’s family had him committed to the Bloomingdale Hospital in White Plains. On 12 June 1899, a New York court declared him insane and ruled that he be permanently institutionalized. But Chaloner had other plans. He believed his family had him committed to seize his fortune and stop his experiments. Bitter sonnets composed during his time at the asylum reflect his anger and desire to clear his name. In November of 1900, he managed to escape to a private clinic, whose doctors declared him able to function in society. Thereafter, Chaloner plotted strategies to both overturn the New York verdict and change lunacy laws in America. During his legal challenges, Chaloner became immortalized by the phrase “Who’s looney now?.” In the summer of 1910, Chaloner’s brother married the opera singer Lina Cavalieri and signed over control of his property to her. The marriage soon broke down, and Chaloner wired his brother the pithy catchphrase. 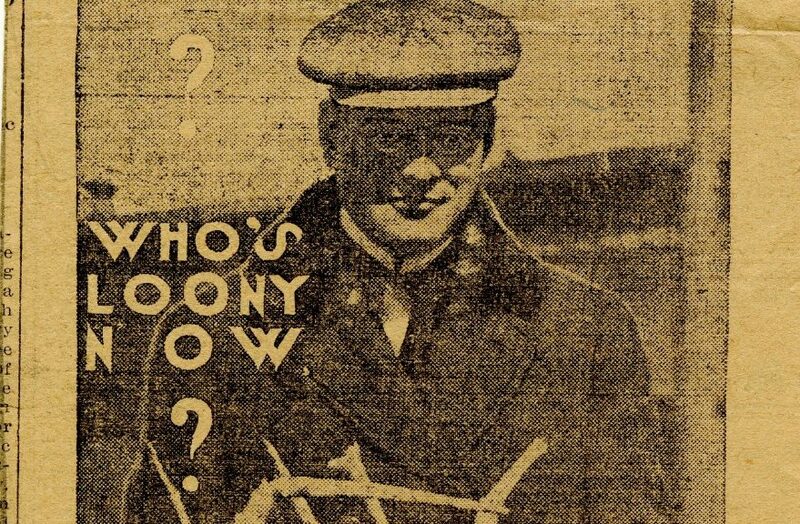 Four years later Chaloner even titled one of his many books The Swan-Song of “Who’s Looney Now?” (1914), drawing on the phrase’s subsequent popularity. Chaloner’s correspondence, copious notes, and book drafts speak to his dedication in clearing his name. 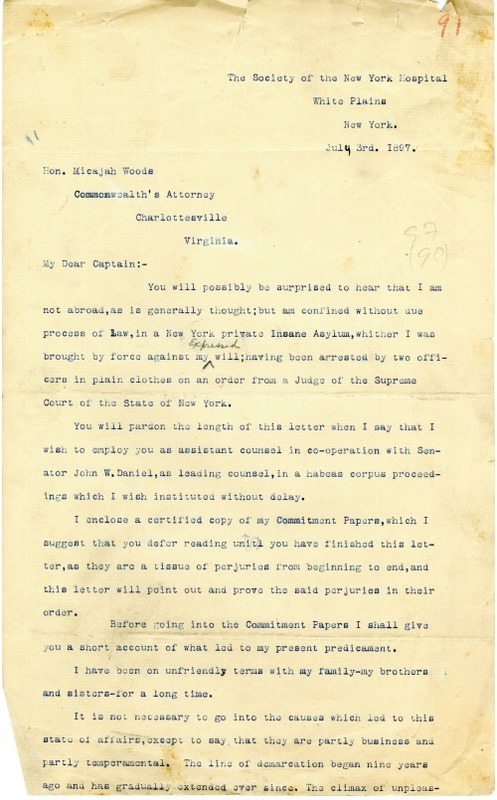 Filled with legal strategy and instructions to attorneys in New York, North Carolina, and Virginia, his letters trace his maneuvering within the legal system, reaching even the U. S. Supreme Court in 1916. In Chaloner v. Thomas T. Sherman, Chaloner sought damages for the withholding of his estate and fortune. Chaloner argued that because he was a resident of Virginia, New York had no jurisdiction. Unfortunately, the Supreme Court affirmed the U. S. Circuit Court of Appeal’s decision. Yet the courts of Virginia and North Carolina had declared Chaloner sane in 1901, allowing him to live and maintain business interests in both states. New York continued to declare him legally insane until 1919, when his family no longer challenged the petition and reconciled with Chaloner. 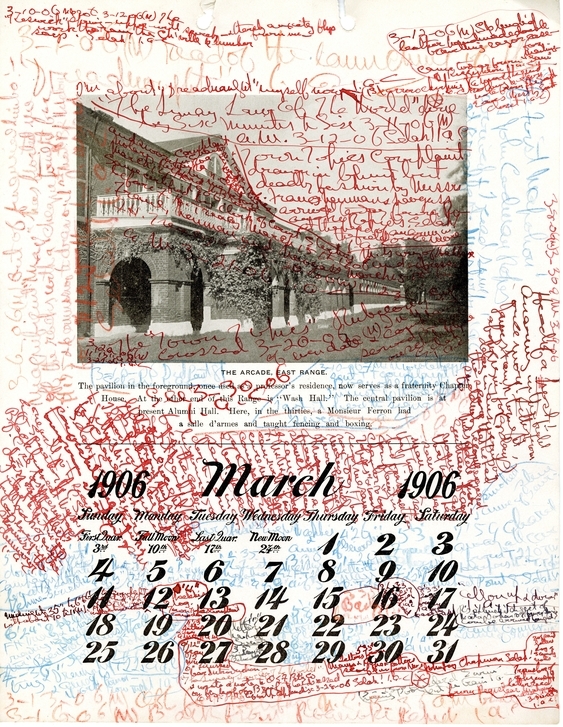 Like his dogged legal challenges, Chaloner’s book drafts, including Four Years Behind the Bars of “Bloomingdale,” or, The Bankruptcy of Law in New York (1906) and The Lunacy Law of the World: Being That of Each of the Forty-Eight States and Territories of the United States, with an Examination Thereof and Leading Cases Thereon; Together with That of the Six Great Powers of Europe—Great Britain, France, Italy, Germany, Austria-Hungary, and Russia (1906), are also filled with annotations and revisions that fill every bit of available white space. Not even a calendar from the University of Virginia escaped unscathed. Chaloner’s papers offer a fascinating portrait into the mind of a determined, if eccentric, man, while also simultaneously portending the burgeoning changes toward psychiatry in both medicine and the law that developed throughout the twentieth century. 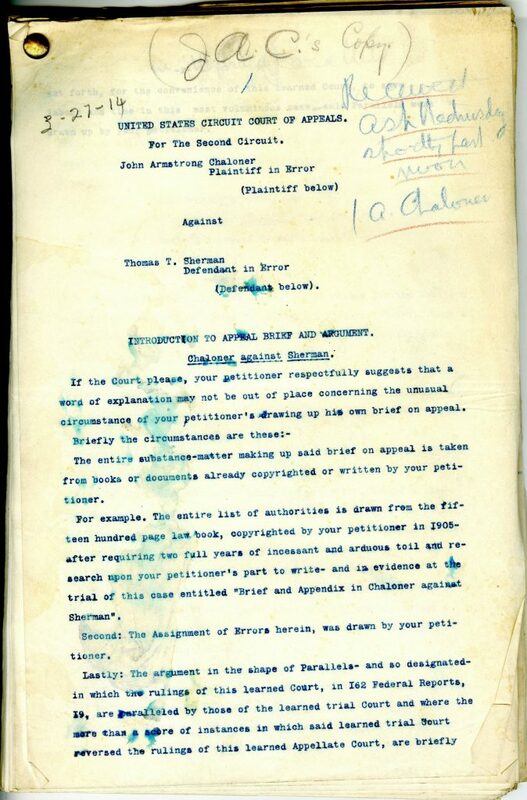 The John Armstrong Chaloner Papers are available for research. The Rubenstein Library recently acquired a collection of letters and diaries from Harry Bernard Glazer, an American soldier who served in the 824th Tank Destroyer Battalion in France, Germany, and Austria in the closing months of World War II. 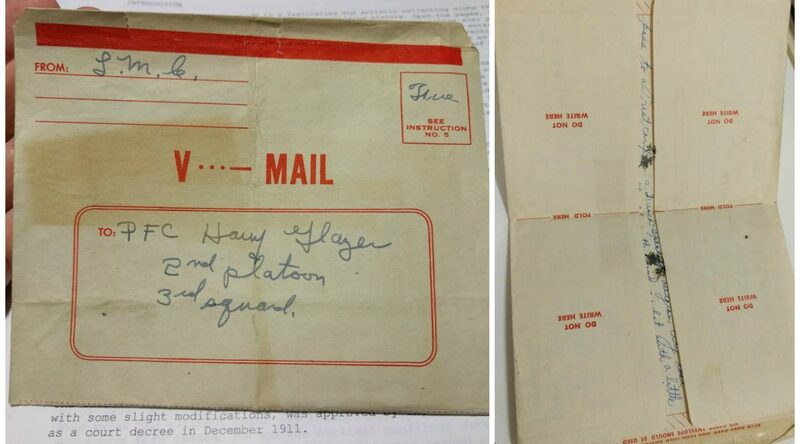 Glazer was an excellent writer and tended towards introspection, so his letters and diaries are full of description and analysis of the war, his efforts to enlist, his training, and his off-duty excursions with his friends and dates. The archive is especially interesting because Glazer writes openly and poignantly about his experiences as a Jewish soldier and the role of his faith in motivating his effort to enlist and fight the Nazis. And it would be up to the reader to have some good reading glasses! 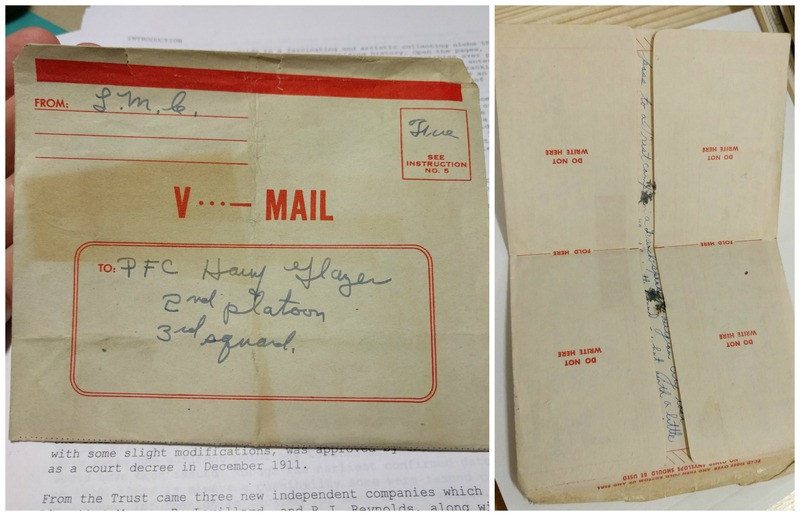 The letters from Harry Glazer to his mother document how quickly V-Mail shifted from being a novelty to being an annoyance for him. 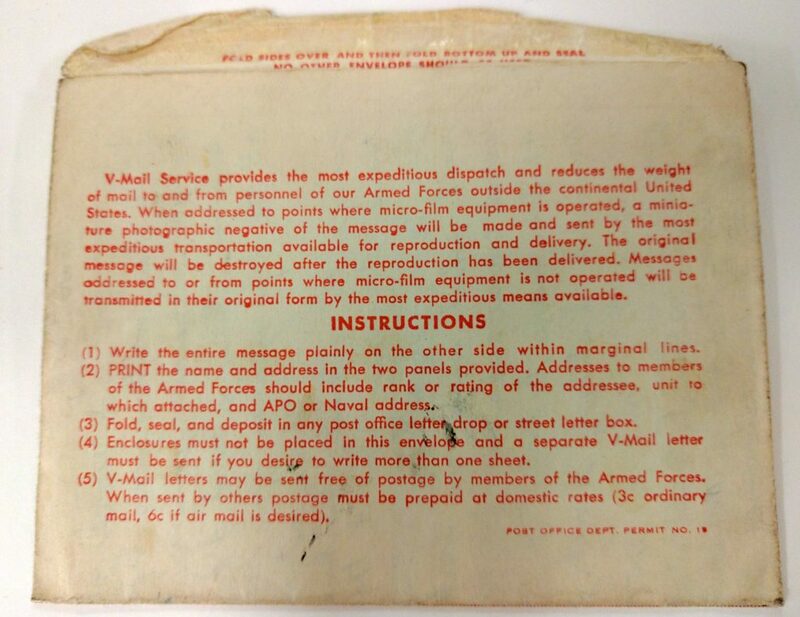 He would number his V-Mails lest they arrive out of order, so his family would be able to reassemble them. The Harry Bernard Glazer Papers are now available for research. Your kind favor of a July 3rd to hand a few days ago, it affords me such pleasure to be in a position where I can converse, if not in person through this medium. it found us all in tolerable good health and delighted to hear of [your?] being well. I am yet so very anxious about my children that I want you to take this letter and show it to Mr Slade urgently requesting him to write to Mr J. Paul Jones (to above address.) 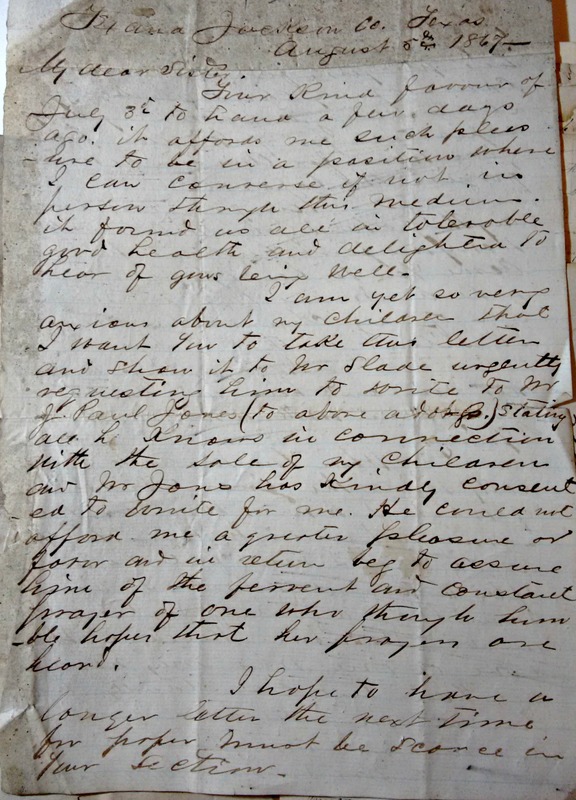 stating all he knows in connection with the sale of my children and Mr Jones has kindly consented to write for me. He could not afford me a greater pleasure or favor and in return beg to assure him of the fervent and constant prayer of one who though humble hopes that her prayers are heard. I hope to have a longer letter the next time for paper must be scarce in your section. You forget to state anything about John Wilkins, who was your first husband. how came you to be separated or is he dead. are you a member of any church you seem so silent on that subject. George says to send his son out here and he will go home with him next spring. When you write to sister Lotty write the general substance of what I have written to her. I am ashamed to hear you [?] of old age. I never feel old unless after a hard day’s work. I am more like a girl of sixteen than an old woman. Receive the love of one who may never see you, but constantly has you in mind. Love from all to your family. Unfortunately we don’t have the letter’s envelope, so I don’t know who Fanny’s writing to. Although she addresses her sister, I can’t be sure they’re actual relatives. I don’t know Fanny’s last name. I don’t know her sister’s name, or where her sister lives. I’m not sure which Mr. Slade she’s referring to, or where he lived (it could be North Carolina, Georgia, or somewhere else). There’s a lot I don’t know about the people in this letter. But, one thing is very clear: Fanny’s looking for her children. The Slades sold them away, or sold her away, at some point before 1865. 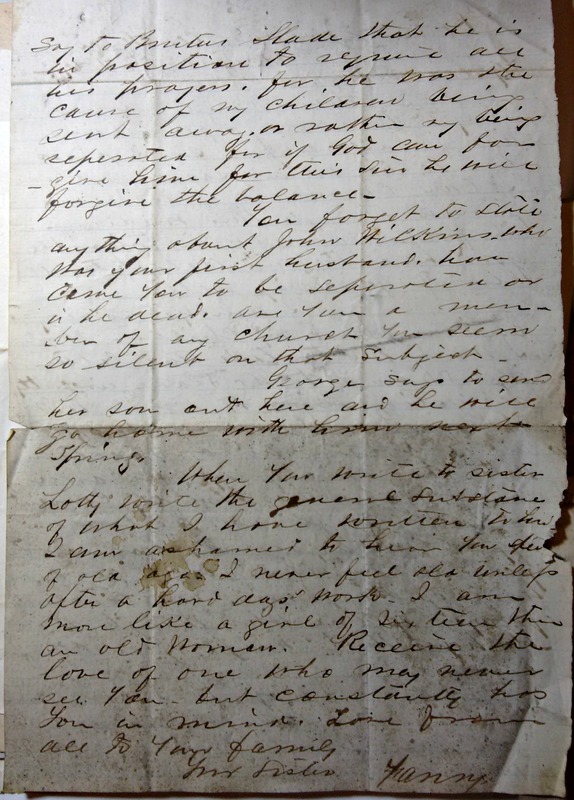 This letter is concrete, powerful evidence of the devastating impact slavery had on African American families, with ramifications lasting long after the the end of the Civil War. I found this letter breathtakingly sad. I couldn’t stop thinking about Fanny. Did she ever find her children? 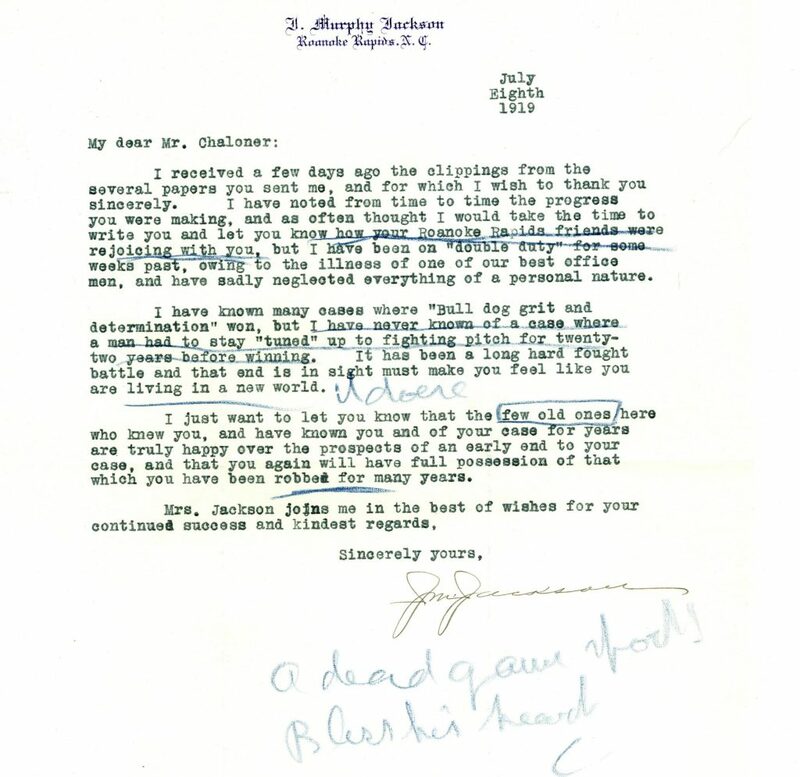 All I could know for sure was that her sister did show the letter to Mr. Slade — because now it is held in the Slade Family Papers. But, unfortunately, I found no further correspondence with Fanny or J. Paul Jones in the collection. I decided to look for circumstantial evidence instead. I returned to the pre-war years of the Slade Family Papers to look for evidence of her existence in the plantation records. Despite being able to trace many of the slaves owned by the Slades from the 1830s through the 1860s, Fanny was a mystery. The only hint of a slave named Fanny lies in this estate inventory for Henry Slade, who died in 1838. 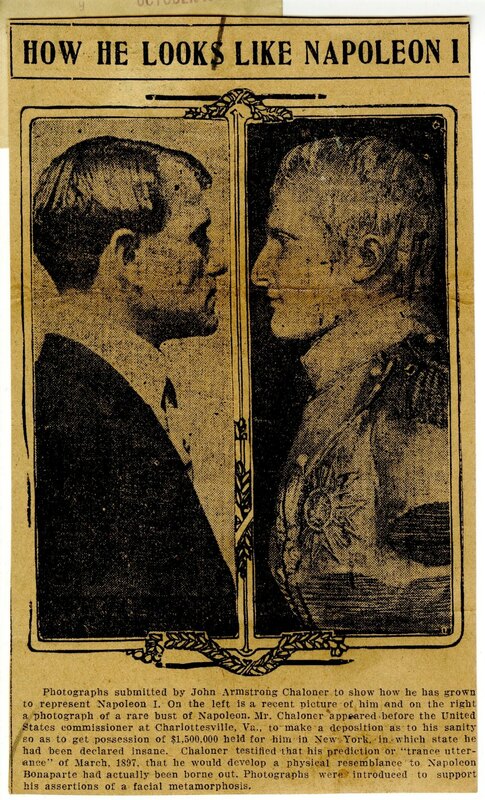 The majority of the papers in the collection stem from Thomas B. Slade and William Slade, two brothers who appear to have inherited the majority of Henry Slade’s estate. In 1838, Fanny was 15, and the estate inventory suggests she was unmarried and had no children. 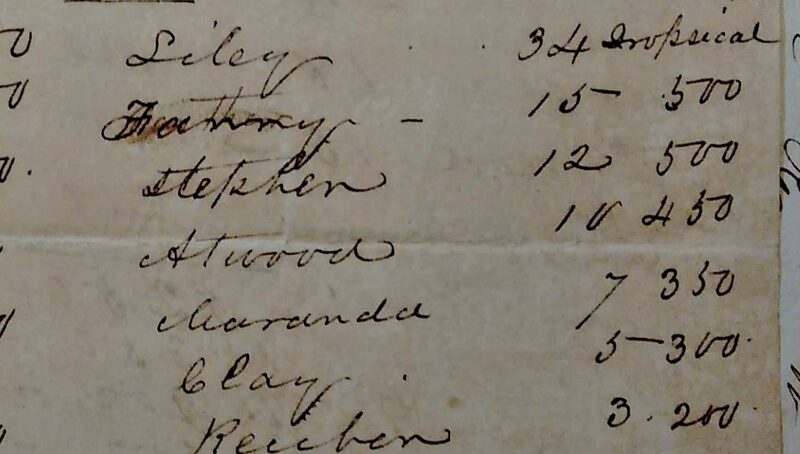 She is listed in what appears to be a family group with Liley (presumably her mother), Stephen, Atwood, Maranda, Clay, and Reuben. Fanny does not appear on William B. Slade’s slave census for 1850, and is not listed on his slave inventories for 1861 or 1864. My guess is that Henry Slade’s Fanny was separated from her mother and siblings shortly after 1838. I base this theory on an undated slave valuation scrap that I found tucked into William Slade’s account book. 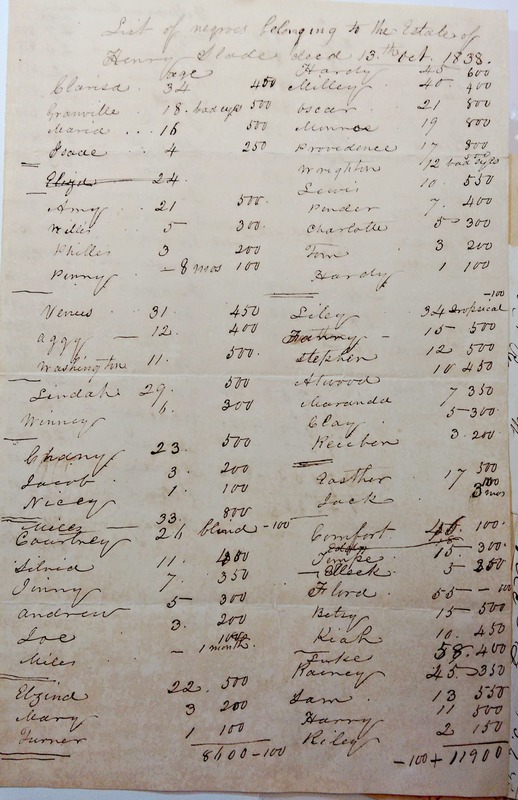 Undated scrap from William Slade’s account book. It lists Liley, Reuben, and Clay — but no Fanny. It has the same names and similar ages as the Henry Slade estate inventory, except several slaves, including Fanny, are missing. I’m guessing this scrap represents the slaves that William Slade acquired as part of the settling of Henry’s estate around 1838. It’s possible that Fanny, Stephen, Atwood, and Maranda moved with Thomas B. Slade down to Georgia, where he ran the Clinton Female Seminary. It appears that Liley, Clay, and Reuben were transferred to William Slade and stayed in Martin County, North Carolina. Clay and Reuben continue to show up on William Slade’s accounts in the 1850s. Since that 1838 Estate List is the only evidence of any Fanny I could find in the papers, I turned back to her 1867 letter. She lived in Texana, in Jackson County, Texas, and referenced J. Paul Jones, a literate man who was writing for her. I decided to look for a Fanny from Texana in the 1870 U.S. Census, using the library’s subscription to Ancestry.com. One problem I faced was the location, Texana, which is not referenced in the 1870 Census (too small, I suppose) and is now a ghost town under the Lake Texana Reservoir. I ended up using J. Paul Jones as a reference point. By 1870, he was living in Victoria, Texas, near enough to Jackson County for me to feel confident that it was him. He was a relatively successful landowner originally from Maryland. I then narrowed the search with a birthplace of North Carolina and a race of Black or Mulatto. And I eliminated the Fannys who were too young in 1870 to have had children before 1865. I ended up with two possible Fannys in Texas; but, neither matched the age of the Fanny on the Henry Slade estate inventory. The first, Fanny Ward, was 26 in 1870; her estimated birth year was 1844. At the time of the census she lived with Lucas Ward (30) and George Nicholson (62) in Matagorda County, Texas, near Jackson County. The letter mentions a George, which is why this Fanny seemed like a possibility. But I’m also thinking that Fanny Ward seemed too young to be referring to herself as an old woman in her letter to her sister. The other option in Texas was Fanny Oliver, from Victoria County, Texas, also near Jackson County. In 1870, Fanny Oliver was about 58 years old, and was married to John Oliver (62). The tone of the letter reads to me like an older adult woman; between these two Fannys, I was leaning toward Fanny Oliver. Slade, Fanny. 45. F. Black. Works on Farm. Birthplace: NC. Cannot Read. Cannot Write. And with her: Slade, Rose. 15. F. Black. Works on Farm. Birthplace: GA. Cannot Read. Cannot Write. Circumstantial evidence suggests this is the right Fanny. She adopted the Slade last name. In 1870 she was 45, meaning that in 1867 she was 42 — she was old enough to have children pre-war. She would have been born around 1825, only 2 years off from the 1838 estate valuation from the Slade Family Papers, which put Fanny’s birth year as 1823. In 1870, Fanny Slade was living in Dooly County, Georgia, which was home to numerous other Slades, both black and white, in the 1870 Census. And most gratifying, in my mind, was to see that in 1870 she was living with Rose, a daughter, which suggests that her quest to be reunited with her children was partially successful. It could be that I’m totally wrong; the Slade Family Papers are frustratingly silent and I’m out of ideas as to how to cross-reference this hypothesis. Too many blanks in the evidence means I have too many unanswered questions, the first being, What Happened to Fanny’s Other Children? I doubt we’ll ever know. Letters from former slaves to their masters, like Fanny’s, are extraordinary documentary evidence of freedmen and women claiming their freedom and their rights. 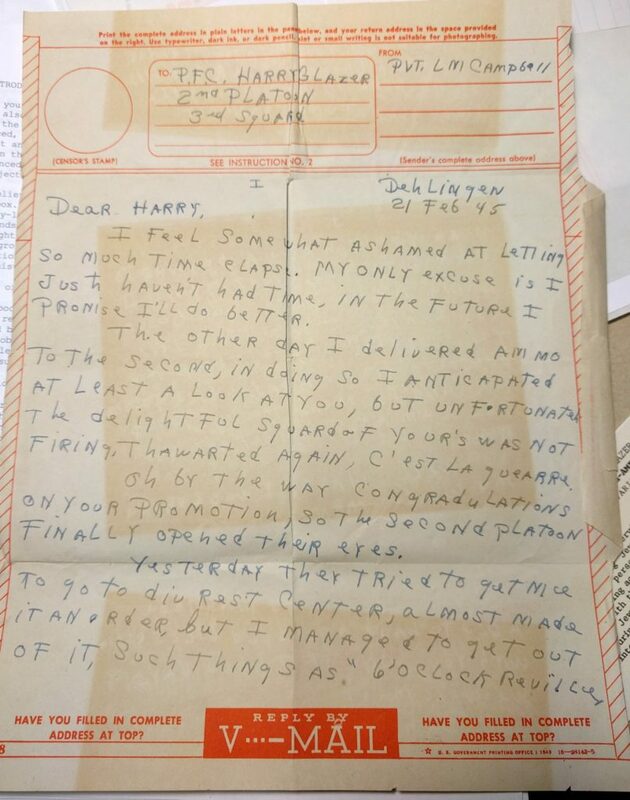 What’s amazing to me is that this letter was not only written, but has survived. So many former slaves did not have Fanny’s resources, especially friends like J. Paul Jones, to help her find her children. I hope that she at least found some answers, even if I never do. 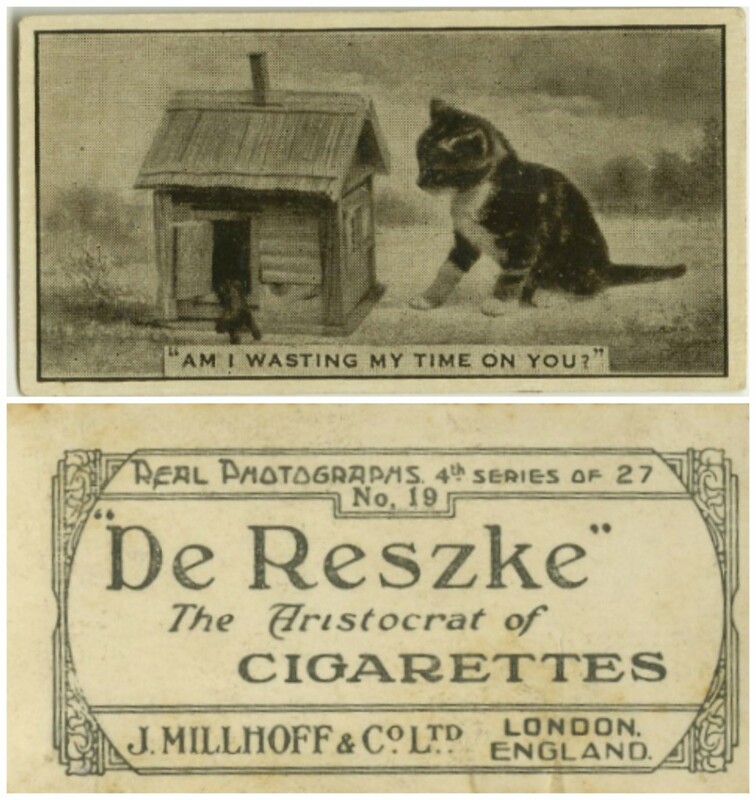 I was delighted to find that one of our newest collections, the Terence Mitchell Collection of Tobacco Advertising, includes a run of Real Photographs, a series for the De Reszke cigarettes produced by J. Millhoff & Co. in England. These tiny cards feature animals posed in funny ways, doing adorable things, with cute captions. 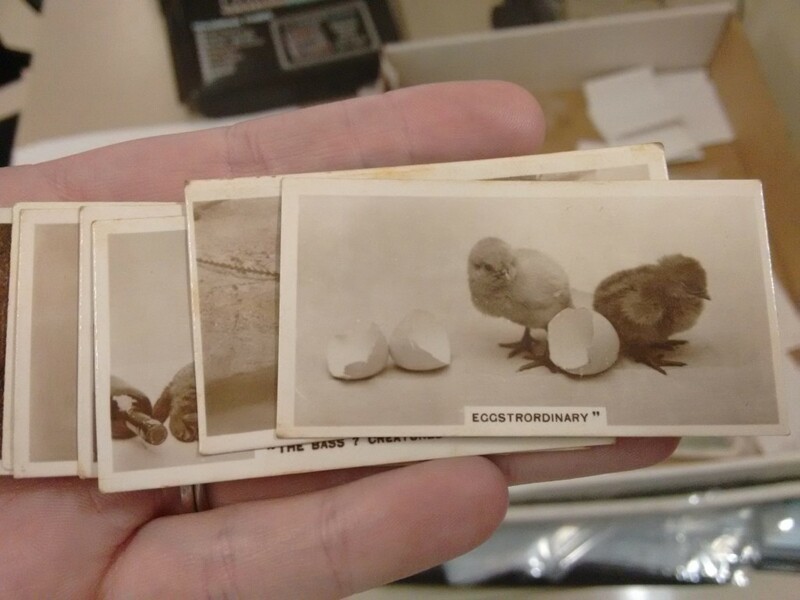 They are basically the tobacco card version of today’s Internet cat memes. 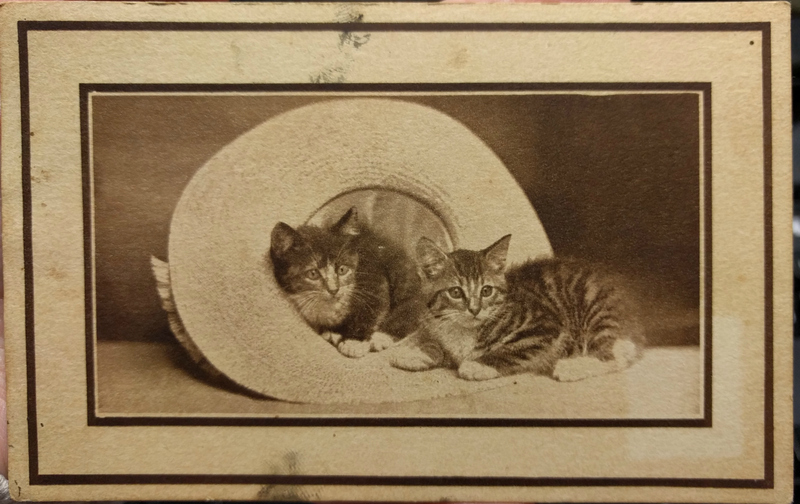 These tobacco cards gave me an excuse to look into the history of cat photography, particularly pictures of funny cats with captions. It turns out that posing cats in outfits is not a new trend, despite the persistent popularity of Internet memes like LOLcats and I Can Haz Cheezburger. 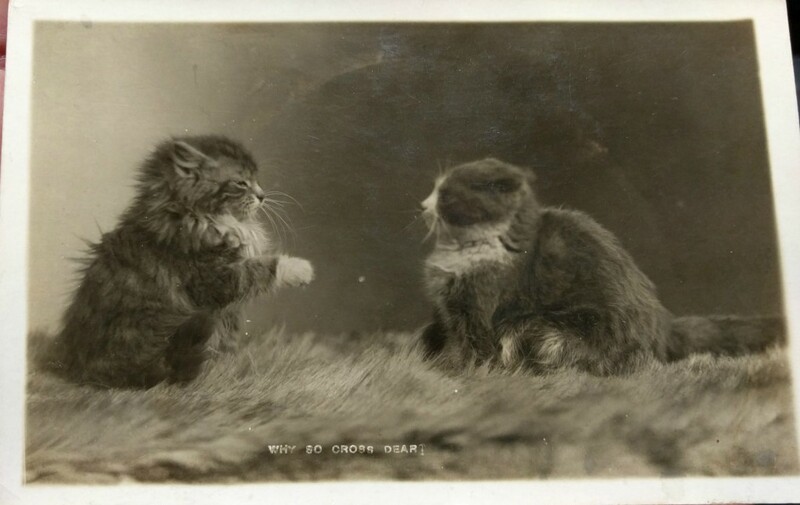 Matthew Hussey’s 2012 article on A History of LOLcats explains that early photographers quickly discovered the marketability of cats, and began selling cat postcards and cartes de visite as early as 1870. 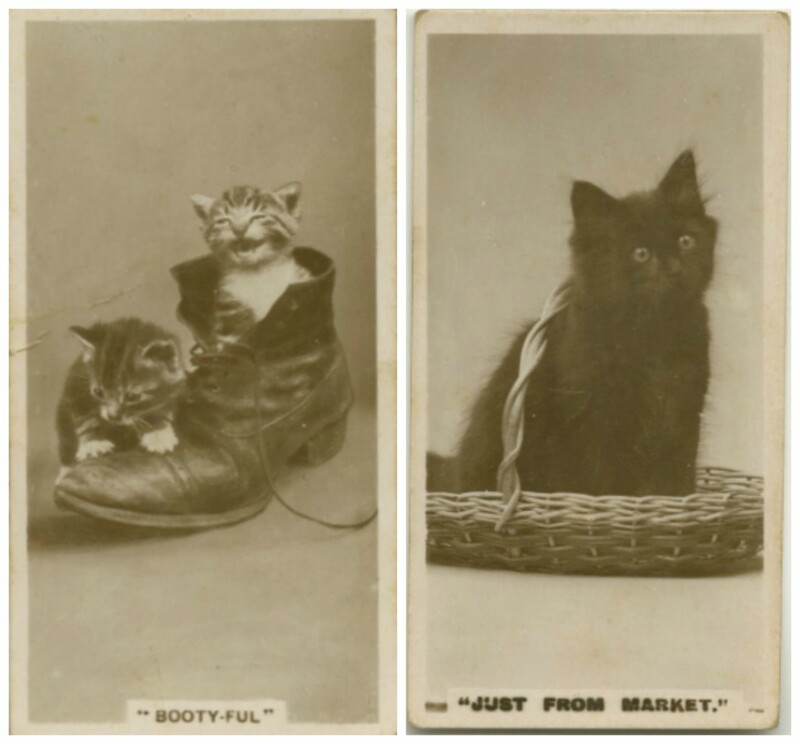 Harry Pointer, the first known photographer of cats posed in silly ways, marketed his photos as The Brighton Cats – so named for his Brighton, England, photography studio. 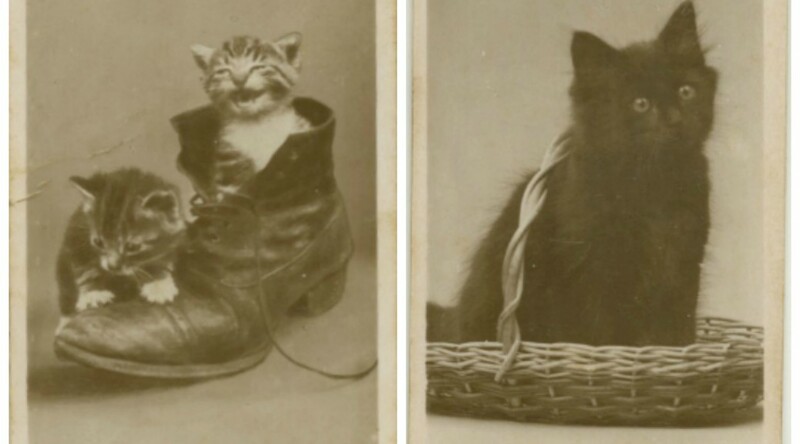 A later photographer who was even more commercially successful was American Harry Whittier Frees (1879-1953), whose postcards and children’s books featured animals, especially cats, doing funny things. Frees was so talented in posing and photographing his animals that some questioned their authenticity. 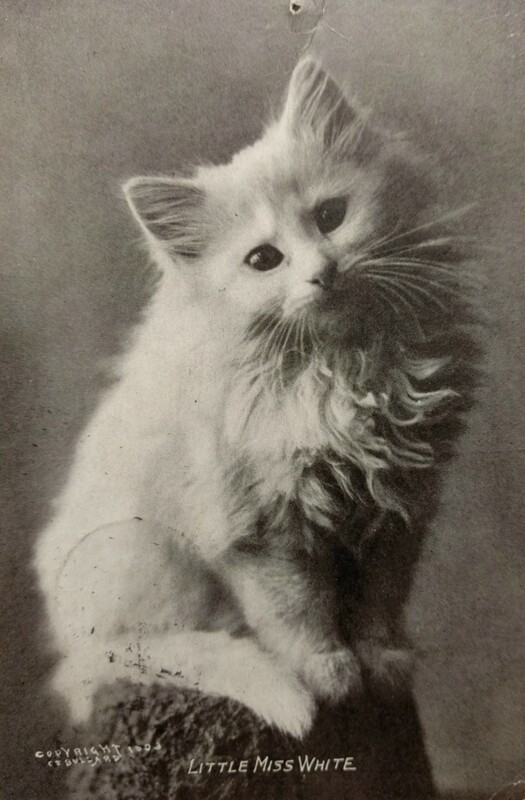 In his preface to The Little Folks of Animal Land (1915), he explained his techniques, saying, “The difficulties encountered in posing kittens and puppies for pictures of this kind have been overcome only by the exercise of great patience and invariable kindness.” After their photoshoot, Frees writes, “my little models … enjoy nothing better than a frolic about the studio.” The Library of Congress now holds a collection of Frees’ photographs. You can view them here. Looking at all of Harry Whittier Frees’ photographs online led to me wonder what sort of cute cat pictures we hold in Rubenstein. You’ll be pleased to know we have several in our vast Postcard Collection. Here are some of my favorites, all from the early 20th century. Caption reads: Why So Cross Dear? Photograph by E.D. Putnam & Son, Anich, N.H.
Photomechanical print. No known photographer. Salt print postcard. No known photographer. Caption: Little Miss White. Copyright by C.E. Bullard. Published by M.T. Sheahan, Boston, Mass. 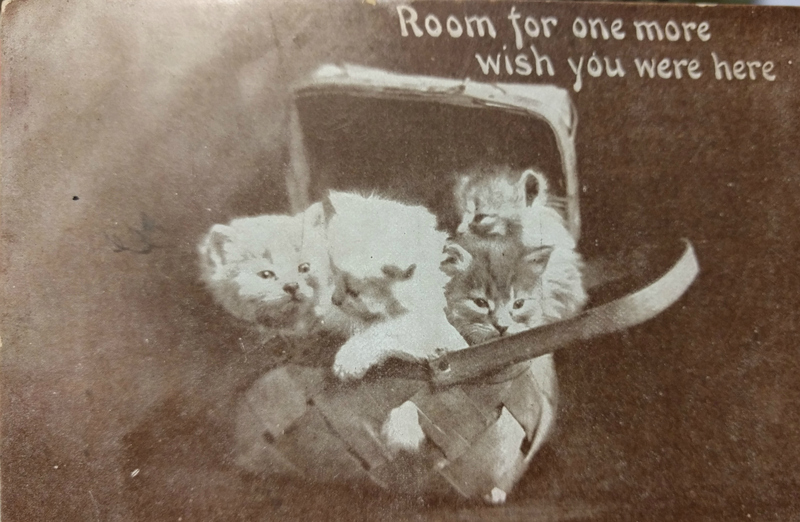 I am on the lookout for other photographs of historical LOLcats, especially those held in Rubenstein collections. If you find some, let me know! Post contributed by Meghan Lyon, Section Head Manuscript Processing. Happy Presidents’ Day! As weird as our current election season has turned out to be, it has a way to go before it compares to the drama and excitement of the 1912 presidential election. That’s the election where William Howard Taft (Republican incumbent), Woodrow Wilson (Democratic challenger), Theodore Roosevelt (former Republican president who lost the Republican nomination and decided to run as the nominee of the Progressive Party, also known as the Bull Moose Party), and Eugene V. Debs (the perpetual nominee of the Socialist Party) battled it out in a four-way race for the White House. Imagine if there had been televised debates back then. You can see a video of us playing with the postcard below. Who will it be? The sender adds the words “Hurray for Wilson!” on the side of the window. 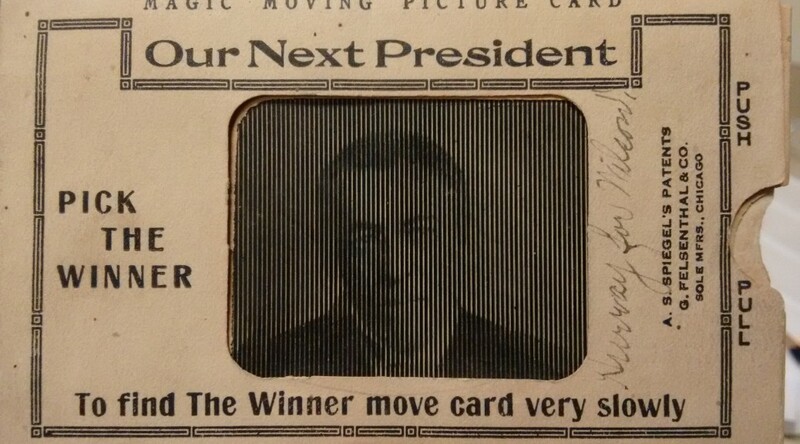 Turns out, they were right — Wilson did win the contest and served as president from 1913 until 1921. Psst, the deadline for registering to vote in our upcoming primaries in North Carolina is Friday, February 19. Register here. Long live the Rubenstein Library Test Kitchen! We’ve had so much fun trying out recipes from our collections that we have decided to continue the series on the last Friday of each month. Christmas is over, but that doesn’t mean that you have to stop eating. If you have room in your life for a little more dessert, I highly recommend trying Doris Duke’s Bittersweet Chocolate Ice Milk, one of hundreds of recipes available in the Doris Duke Papers. Doris Duke’s collection includes boxes and boxes of recipes and menus from each of her houses — Duke Farms (Somerville, New Jersey), Rough Point (Newport, Rhode Island) , and Shangri-La (Hawaii). Duke appears to have collected a lot of her recipes during her travels (Thai and Hawaiian recipes were favorites), but her books also have plenty of American-style comfort food. Looking through the recipes was really fun, and it was hard to choose just one. 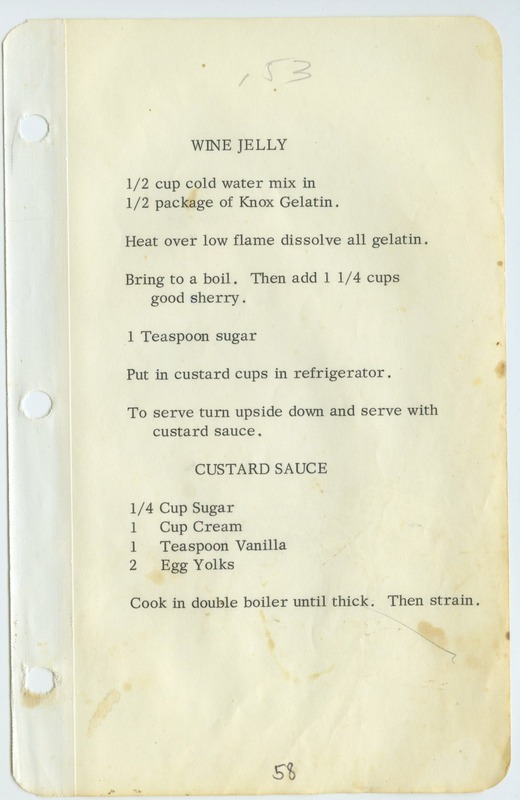 I found a great one called Wine Jelly, which appears to be Doris Duke’s take on jello shots — except with sherry. I wanted to make something to share with the Rubenstein Staff Holiday Party, so I went with the chocolate ice milk. It’s not quite as wild as some jello shots, but does have a ridiculous amount of chocolate, as well as espresso and a bit of cognac. And don’t worry about your New Year’s resolutions: it’s ice milk, not ice cream, so it’s totally healthy! 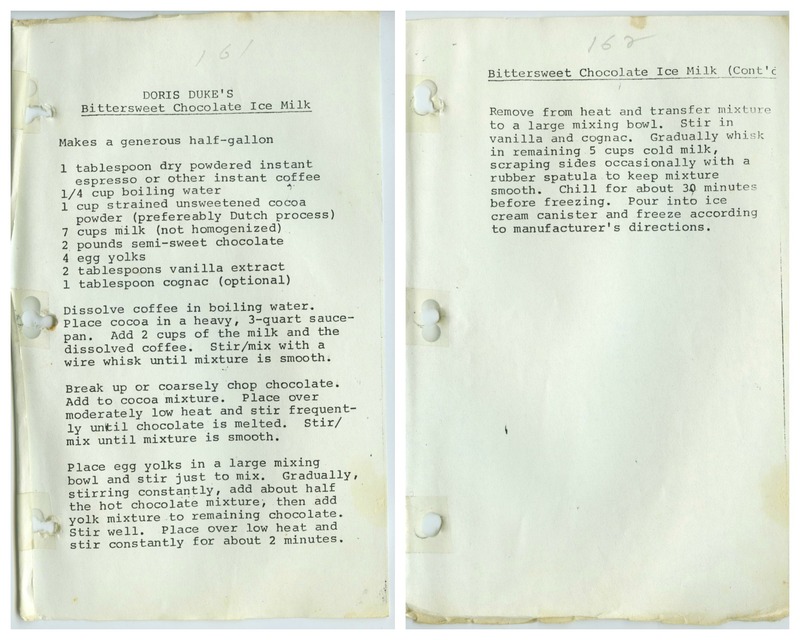 Doris Duke’s Bittersweet Chocolate Ice Milk, from Box 177 (Folder 2) of the Doris Duke Papers. The recipe dates from the early 1990s, so I found it fairly easy to make. 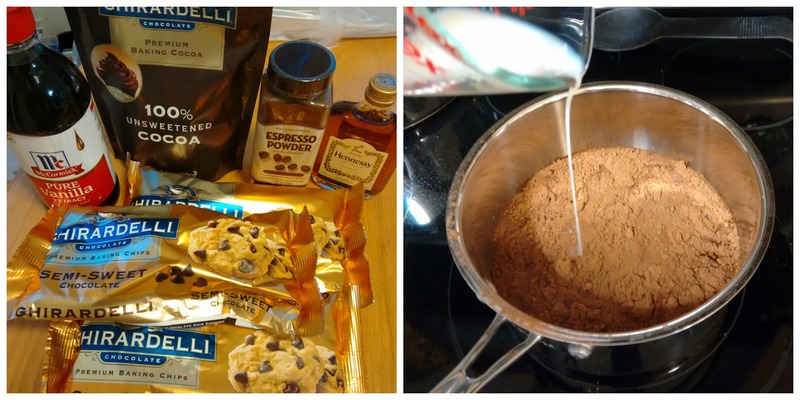 The “bittersweet” part of the title is misleading — although the recipe has a cup of unsweetened cocoa powder, it also has a full 2 pounds of semi-sweet chocolate. I used chocolate chips to save myself the effort of chopping chocolate. I also used homogenized skim milk, which seemed to work fine. The trickiest part for me was tempering the eggs, which involves pouring some of the warm chocolate into the yolk mixture, and then reuniting all of it back on the stove top. 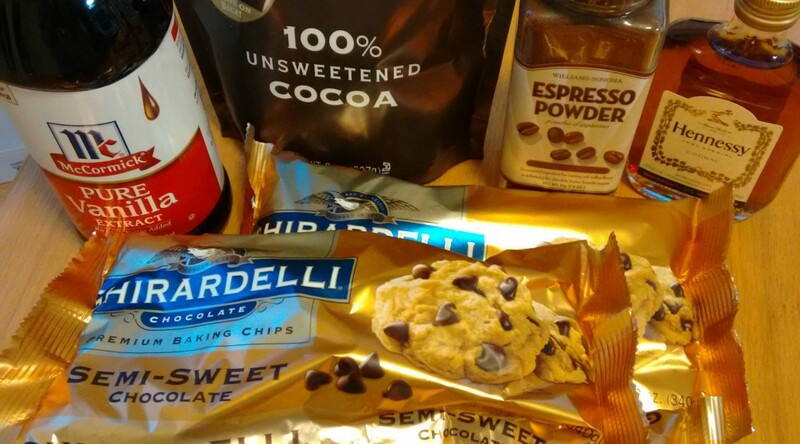 Do not expect any drastic change in the chemical composition of your mixture. 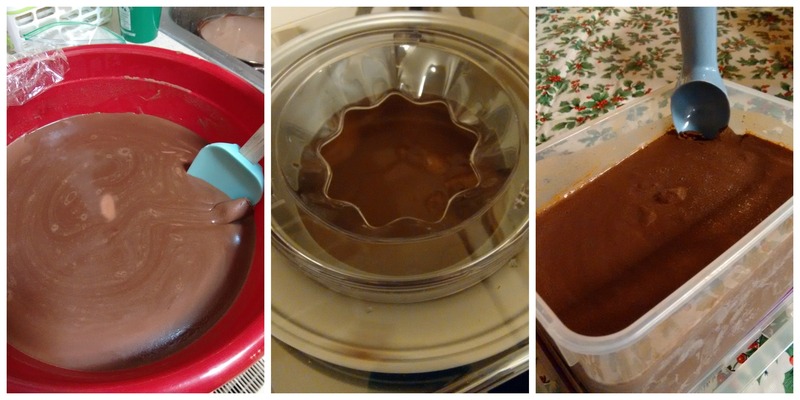 When I finished heating everything and was ready to let it chill for 30 minutes, it basically looked like a giant bowl of chocolate milk. I was worried I would have to serve it with a straw. After chilling for 30 minutes, a loose film had started to appear on the top of the mixture, which was reassuring. I put it in my ice cream maker for about 20 minutes, which thickened it up nicely. After an overnight in my freezer, it was ready for the party. 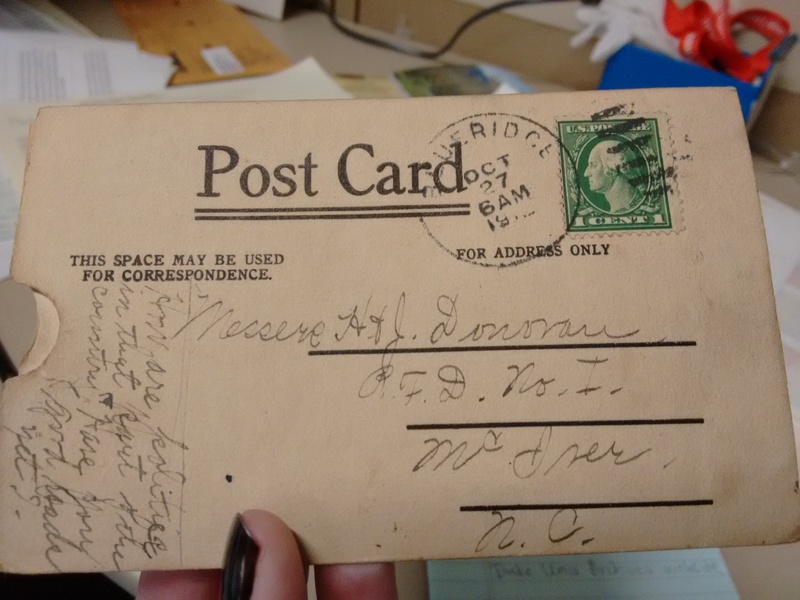 Post contributed by Meghan Lyon, Technical Services Archivist. While I processed a collection of correspondence between two lovers, a handful of letters stuck out. Martha Simpson, then Martha Eleanor Booker, a young African American woman working on her teaching degree at Elizabeth City Teachers College, had a penchant for writing in code. Paul Simpson, her love interest, did not share the same inclination, but did indulge her in his responses. As I read through the letters, the code used in three of them piqued my curiosity. My search revealed that the code used seems to be a form of carnival Pig Latin, also known as Czarny, Z-Latin, or Carny (Hautzinger 30). 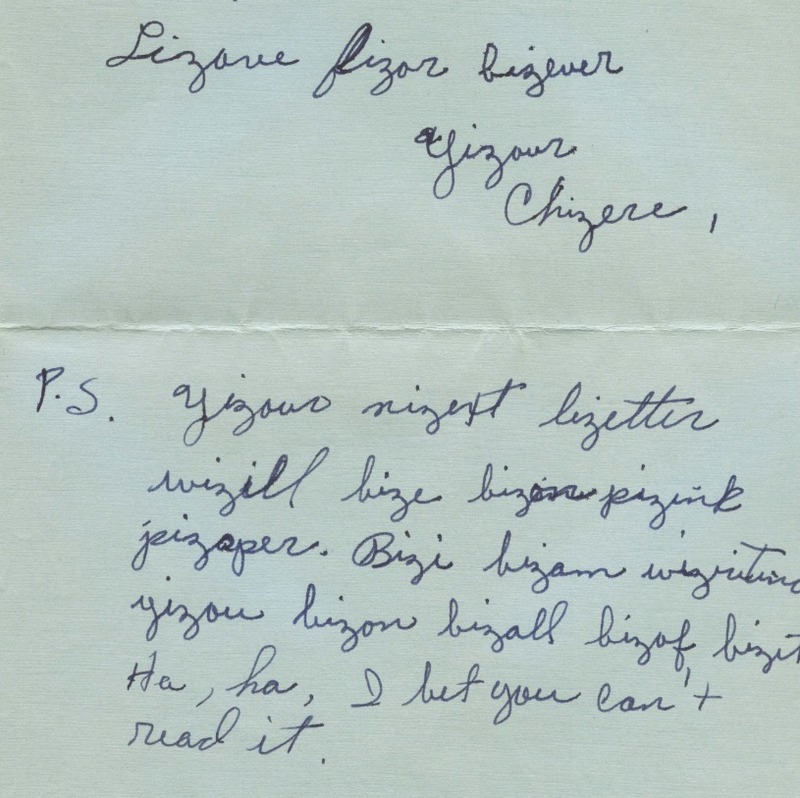 Martha first sneaks in her secret code at the closing of a letter from January 10, 1951, with a little taunt, “Ha, ha, I bet you can’t read it.” Paul’s response to this letter, dated January 13, 1951, briefly acknowledges that he, indeed, could read her secret language with the opening line “Dizear Cizheré,” before continuing his letter unencumbered by the extra z’s. But Martha doesn’t give up. She continues the code in a response from January 17, 1951, written half in this “z-language,” eventually switching back to conventional English. Martha’s next letter clearly was not on pink paper (did you catch that one? ), but she did keep on with her code. The secret language was formed by inserting iz after the first consonant, and if there was no consonant present, beginning the word with biz. In linguistic circles, this is known as iz-infixation and has been linked to rap and hip-hop music. Examples include Frankie Smith’s 1981 hits Double Dutch Bus and Slang Thang (or Slizang Thizang), both of which boast the iz-infix in their lyrics. More recent examples include work by Snoop Dogg and Kanye West (Viau 1). But these letters come decades before the iz-infix made it big in music, and the question remains: Where did this secret language come from? We think the answer is this: carnival slang. Published accounts of Carny go back to 1926 (Russell and Murray 401), well before Martha was writing to Paul. It was a language immersed in the subculture of the carnival, intended to distinguish between outsiders and the true Carnies, given the questionable legality of the carnival. Sarah Hautzinger describes it as a dialect that “rearranges English to make it unintelligible to the unenlightened ear” (32). In Czarny, “a Z-sound is inserted after the first consonant, and if the word begins with a vowel, before the vowel sound, in the first syllable only” (32). This certainly seems a lot like the iz-infixes found in the letters between Martha and Paul. Rumor has it that this carny talk found its way into popular culture years later. 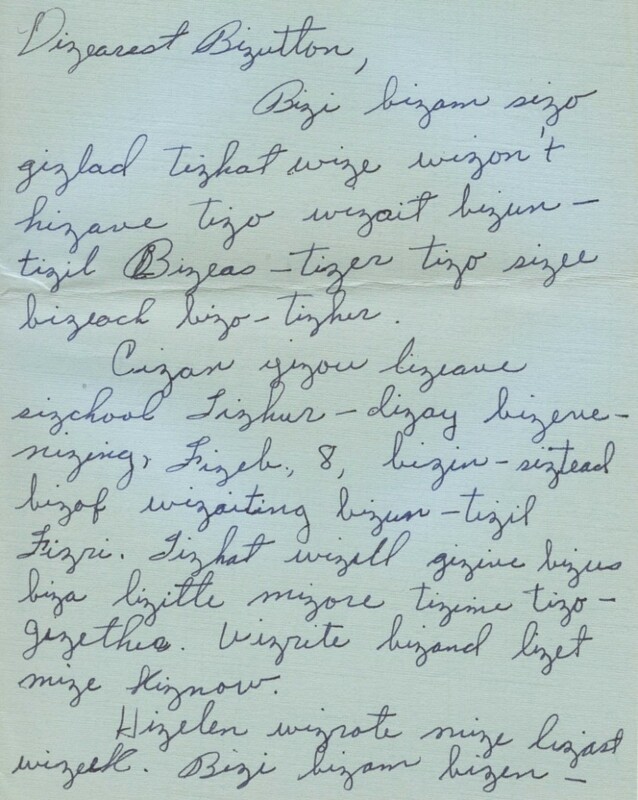 Whether or not their secret language was descended from Z-Latin, the coded (and uncoded) correspondence between Martha and Paul D. Simpson provides an interesting read. Recently acquired by the Rubenstein, these roughly 300 letters detail the love, life, and struggles of a young African American couple on their way to becoming teachers. 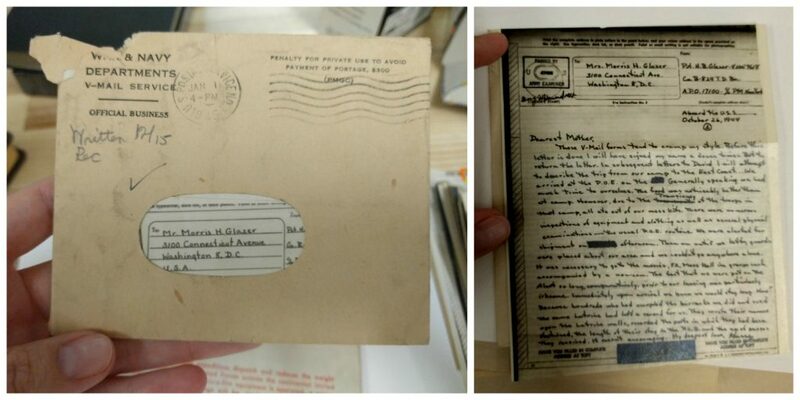 For more information on the Martha and Paul D. Simpson Papers, check out the collection guide. Hautzinger, Sarah. “Carnival Speech: Making the Jump.” Journal of American Culture, 13: 29–33, 1990. Web. 16 December 2014. Russell, Carol L. and Thomas E. Murray. “The Life and Death of Carnie.” American Speech, Vol. 79 No. 4: 400-416, 2004. Web. 16 December 2014. Viau, Joshua. “Introducing English [IZ]-Infixation: Snoop Dogg and bey-[IZ]-ond.” 2006 LSA Summer Meeting, 24 June 2006. Web. 16 December 2014. Post contributed by Janice Hansen, a Ph.D. student in Germanic Languages & Literature and Technical Services intern at The Rubenstein. 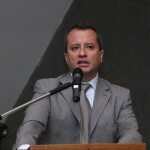 Eduardo González is Director of the International Center for Transitional Justice’s (ICTJ) Truth and Memory Program, which provides advice to countries on truth commissions, declassification of archives, memorialization activities, museums, and other instruments. He has provided technical and strategic support to truth-seeking initiatives in places as diverse as East Timor, Morocco, Liberia, Canada, and the Western Balkans. 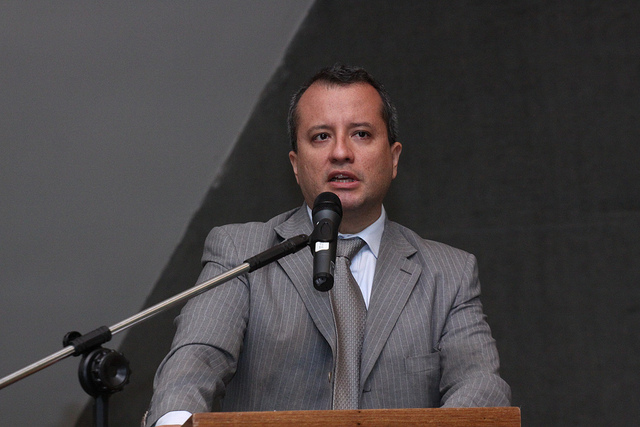 Before joining ICTJ, he helped organize and carry out the Peruvian Truth and Reconciliation Commission. Previously, he worked as an advocate for the establishment of the International Criminal Court. The historical records of ICTJ are also part of the Human Rights Archive in the Rubenstein Library. Pamela Merchant is the Executive Director of the Center for Justice and Accountability (CJA), and an attorney with 25 years of experience in the conduct and management of complex state and federal litigation. 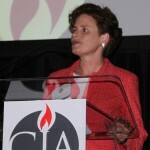 She joined CJA in October 2005 and has overseen a period of significant growth – both programmatically and financially. 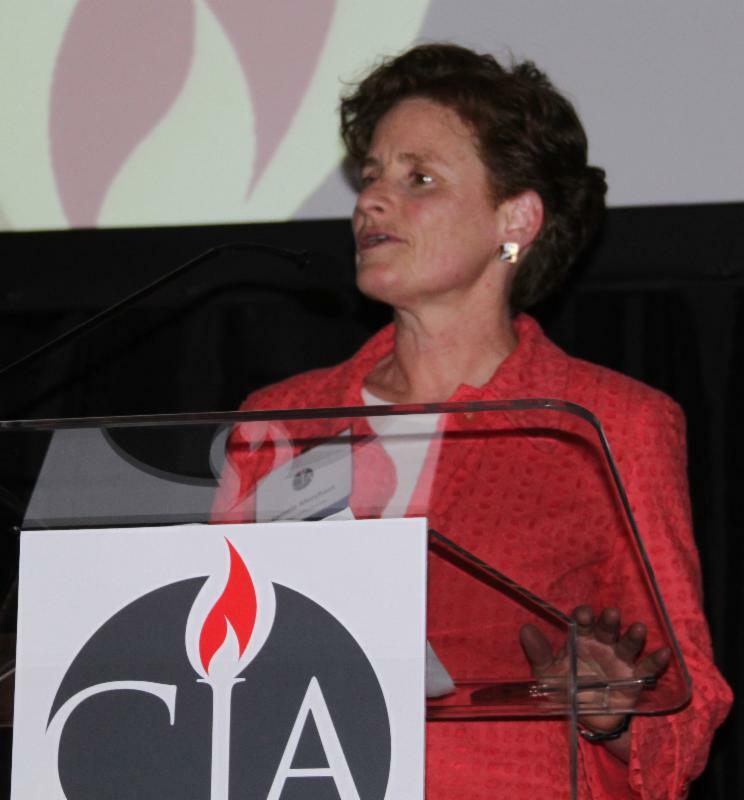 Under her leadership, CJA has grown from an organization devoted solely to human rights litigation in the U.S. to one that also engages in human rights litigation in foreign jurisdictions, such as Spain and Cambodia. Ms. Merchant has testified before Congress on accountability for human rights abusers and other human rights issues and received degrees from Georgetown University and Boston College School of Law. Ms. Merchant will explore changes in the field over the past 30 years with a particular focus on the resilience of survivors and their communities and the critical role they play in building high impact human rights cases. All sessions are open to the public. For a free lunch, please RSVP to emily.stewart@duke.edu by Thursday November 13th. Sponsored by The Human Rights Archive at the Rubenstein Library, the Duke Human Rights Center at FHI the Trent Memorial Foundation. Cosponsored by the Center for Latin American Studies, Duke History Department, and Duke Cultural Anthropology. For further information contact Patrick Stawski, Duke University patrick.stawski@duke.edu 919-660-5823. Artist Vik Muniz, known for painting with nontraditional materials, returned to his native Brazil to portray workers in one of the world’s largest garbage dumps, Jardim Gramacho, on the outskirts of Rio de Janeiro. He collaborated with these “catadores”–self-designated scavengers of recyclable materials–to create portraits of them made entirely of garbage, returning the profits from their sale to his subjects. 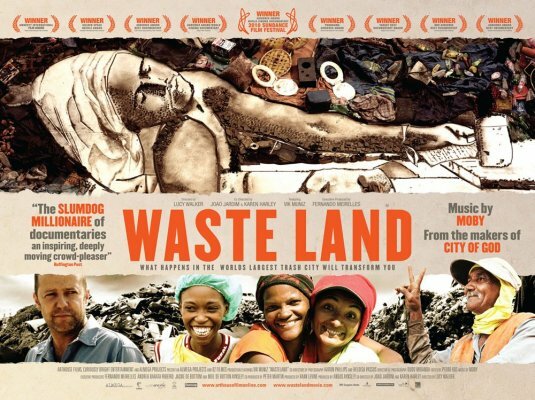 Over three years, the filmmakers followed Muniz and this eclectic band of catadores, revealing both the dignity and despair of their lives, in a multivalent collaborative work engaging with issues of artistic process, social justice, responsibility to one’s subjects, class mobility, activism, and beauty. In English and Portuguese with English subtitles. There will be a reception at 6:30 p.m. and the screening will begin at 7 p.m. A panel discussion with Professor Pedro Lasch follows the screening. Sponsors: The Duke Human Rights Center@ FHI, the Human Rights Archive, and the Archive of Documentary Arts and Screen/Society. Co-sponsored by the Global Brazil Humanities Lab. Please join us on Wednesday, October 29 at 5:30 p.m. for our next Trent History of Medicine lecture. Karen Kruse Thomas, Ph.D., will present An Unlikely Alliance: Medical Civil Rights Reformers and Southern Senators in the Age of Deluxe Jim Crow. A reception will follow the talk. How could Jim Crow segregation ever be described as “deluxe”? Thurgood Marshall, lead counsel for the NAACP Legal Defense Fund, used the term “deluxe Jim Crow” to refer to the efforts of southern state and local governments to shore up segregation by spending money to improve separate black facilities and programs. This strategy was applied to the fullest extent in health care, with federal assistance from the Hill-Burton hospital construction program and other health initiatives. Although the majority of civil rights history scholarship has focused on issues that captured extensive media attention such as school desegregation, public accommodations, and voting rights, the story in health care was largely overlooked, at the time and since. Yet the unlikely alliance during the mid-twentieth century between medical civil rights activists, southern policymakers, and New Deal liberals has much to teach us about the possibilities and limits of political compromise, especially in the context of our own era of Congressional deadlock. 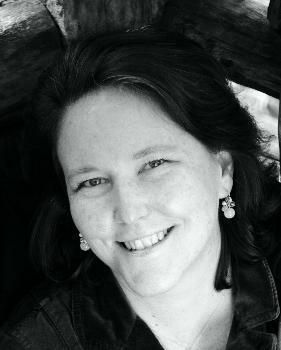 Karen Kruse Thomas has served as Historian of the Johns Hopkins Bloomberg School of Public Health since 2012. Dr. Thomas earned her doctorate in history from the University of North Carolina at Chapel Hill, and has taught U.S. history at the universities of North Carolina, Minnesota, and Florida. Her publications in the history of medicine and public health have received national awards from the American Association for the History of Medicine and the Southern Historical Association. She’s also received grants from the National Endowment for the Humanities and the Harry S. Truman Presidential Library. In 2011, the University of Georgia Press published her first book, Deluxe Jim Crow: Civil Rights and American Health Policy, 1935-1954. The event is sponsored by the History of Medicine Collections and the John Hope Franklin Research Center for African and African American History and Culture.